Bonjour lecteurs! I hope you are fine and thrilled about the end of the term? I am in for 5 weeks at home before going back to work. No need to say that I am really excited about it! You know what it means? I will have more time to blog and share with my readers our views on many products and services we are currently trying! Oh yes, I will also have more opportunities to spend some quality time with Baba like we did last weekend at Bubble London! To celebrate the start to a great Summer break, we have a special giveaway out there for all the mamans (but not only! Any fashionable lady too!) who love reading our blog. 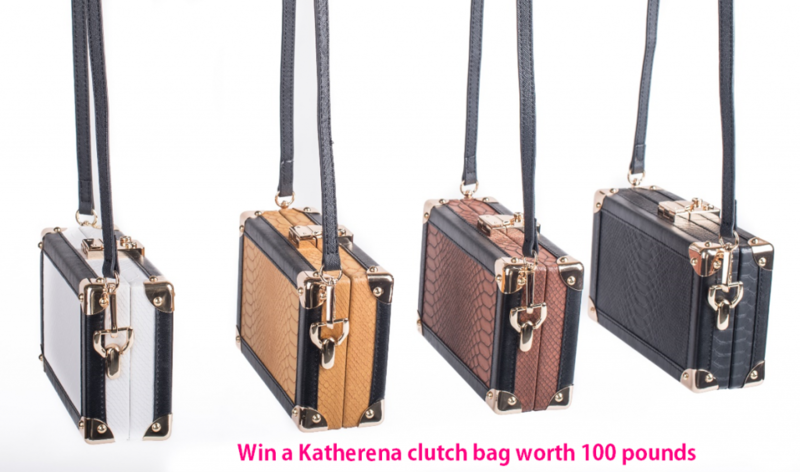 Yes, today our Katherena Clutch Bag Review will give you the chance to win a gorgeous clutch bag worth £100! Quelle chance! Katherena bags was created by Katie Sykes in May 2017. The brand is pretty new and we are very excited to be one of the first bloggers to review their products. Frenchie Mummy is not only about being a maman. As a modern woman, I like being elegant. I have always been a big fan of bags, so when Katherena asked us to try their core item, I could not resist! The brand has something for everyone. If a clutch bag is un peu too much for you, the label also offers some chic rucksacks with very cute colours. Personally, I like elegant bags that make me feel feminine. Let’s see what we thought of our new sac à main. A good bag is a girl’s best friend. I know what I am talking about. I reckon I have about 30 handbags. Oui, nothing less… I particularly love French brands and leather bags as I want my accessories to last as long as possible. A good handbag is something you can wear years and years after buying it. 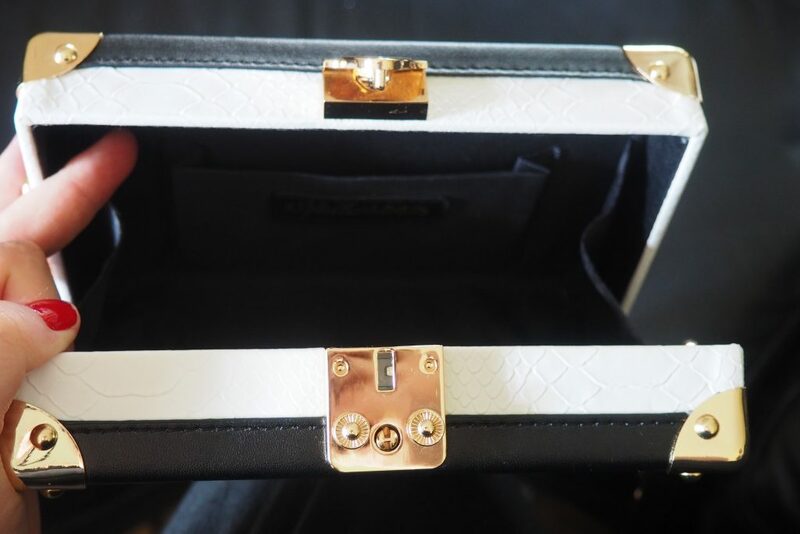 We received this Hollycroft Trunk Clutch bag in white and I was not disappointed. 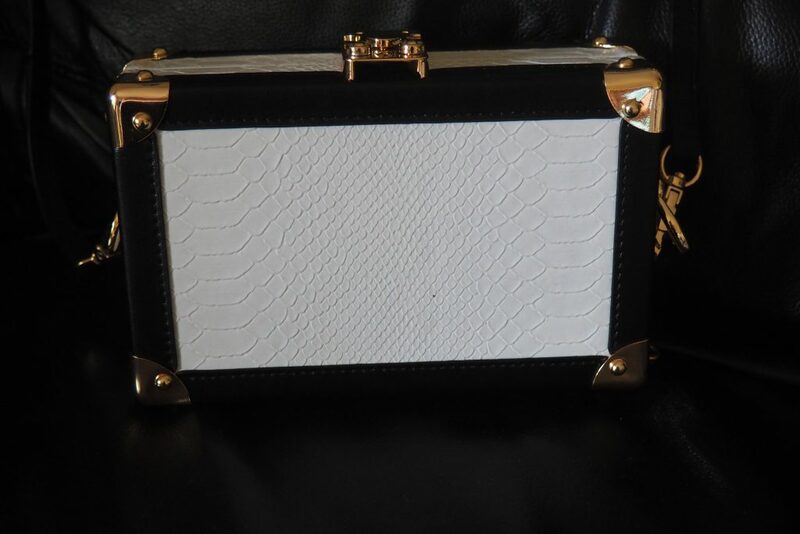 It is made from crocodile-effect PU leather and the finishing is simply fantastique. I am more of a totes’ lover, but with Baba, my bag needs to be practical. A gorgeous finish… Who could resist?! Its size is just parfaite as I can carry all my essentials such as my phone, some money, a spray and a good lipstick. I really like the look of this bag. It’s very different and the lock is really nice. It looks like a mini trunk, but the material and the shoulder strap make it very feminine. To me, the best features are definitely the size and the fact that I can wear it and be hands-free. So important when you are une maman 🙂 There is also a small pocket inside so that I can put my Oyster and easily get access to it. I love the colour in white. The label offers this model in black, brown and mustard but I am happy to have chosen white as it can go with anything. I love the vintage feeling of this accessory. It will be for sure on my shoulders during all Summer! Because of its nice finishing, it will be the perfect evening clutch bag, but I will also team it up for a more casual look (un peu bohême) when I am out and about in the park with Baba! My friends are all jealous and already asked me about the label. It’s always a good sign! Are you looking for a new fabulous handbag for this Summer? Do you want to wear a classy and elegant bag to walk around the park, one that all the other mummies envy you to have? This is your lucky day! It’s worth £100 but you can have it for free! Katherena is giving one of our lucky readers the chance to win a free Hollycroft Trunk Clutch bag worth £100. And do you want to know the best news? You can have the bag in the colour of your choice! Are you in for something a bit traditional? Go for a black one. Do you want something a bit different? Opt for the brown version. Do you like something brighter? Then select the mustard one. This giveaway starts on Saturday 22nd July at 5 pm and ends at midnight on Tuesday 22nd August 2017 at midnight. The closing date is 11:59 pm on Tuesday 22nd August 2017 at midnight. Provision of the prize is the responsibility of Katherena. We will treat your data in confidence and will not disclose it to third parties. Disclosure: we received a free bag in exchange for an honest opinion. 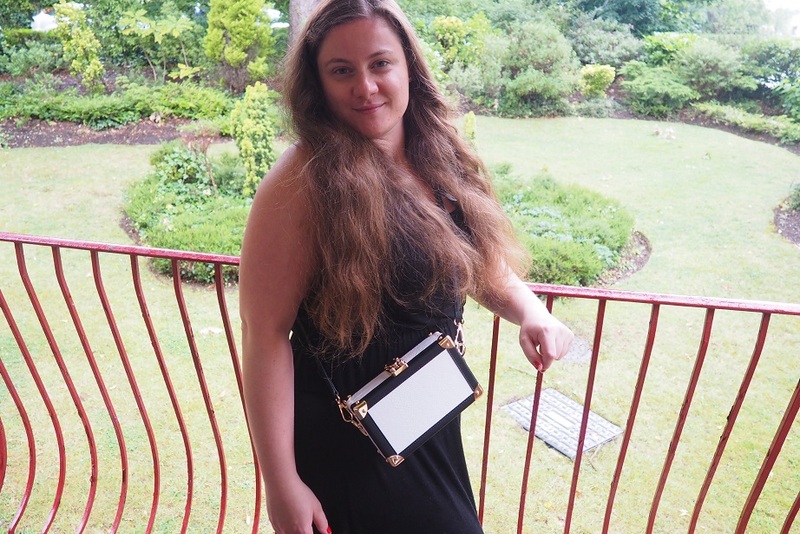 I hope you liked reading our Katherena Clutch Bag Review! 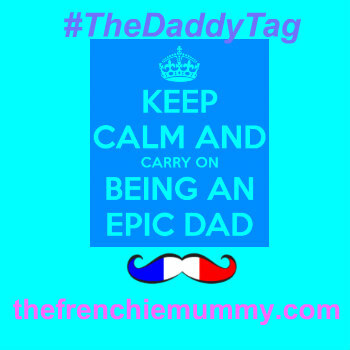 If you can’t wait for the giveaway to be over and want to order one of this fab bags now, enjoy 20% off with the Frenchie Mummy Blog. Simply enter the code ‘Frenchie’ at the checkout. You can’t say that we don’t spoil you 🙂 A Frenchie GIVEAWAY and a fabulous discount with a cute brand to start the Summer holiday! That is what I call le paradis. Don’t you think? See you later for more fab Frenchie giveaways. I prefer the black – classic! I prefer the black one. I prefer the clutch bag in black. I will choose white but would love any of them. It’s a tough call between the black and the brown but because I would want to use it so much I will say the black is my favourite as it will go with everything! My wife would love the black one please! Black is definitely a must have, goes with everything. I love the handbag in black. I’d like the Mustard one. I love the Brown ….though i’m torn over the Mustard too. I love it in mustard! I like the black, goes with everything! I like the black one. I really like the black one, it’s a classic and could be worn with most things. Good luck everybody! Black would be very versatile. They are all lovely but I prefer the brown. Black one is my favourite. I would like the black one as I think it will go well with all my outfits. I really like the black and the brown versions. My favourite is probably the black. I love the black, its so elegant, I’d love one! That’s difficult but I’d probably go for the brown one. Oooh I love the black! classic black is the one I prefer. My wife would love the mustard one for sure! Got to be the classic black! I do like the black as im a bit of a traditionalist but I also rather like the brown! I usually go with standard black handbags but im in love with the mustard colour!!? I love the black one! I prefer the black colored one. So cute! Black is my favorite. I really love the mustard one. Not often you see this colour for a bag. Tough choice! I think m gonna say black but I love the mustard, too. Definitely the black – sleek & can be styled with anything! I can’t decide between the white or the black! They’re all gorgeous – think the mustard is my fav though. I love the black as it’s so versatile. I love the Black one, yes please. Hard call, but I like the classic black. It would go with just about everything, and I already have some brown bags. I like the dark brown one! The black one is my favourite! I really love the mustard one, but I’m going to choose Black as it is the most practical and would get used the most as it works with every outfit. Playing it safe, but you just can’t go wrong with black, and it’s my favourite too. I would prefer the Black one, please! I think I like the mustard one the most. Tough choice, but I think I prefer the brown. I love the black! But the white is gorgeous too ??? White since I own a few black bags already! I prefer the BLACK please. The black is so classy. The bronze one for me! I really like the tan colour! My choice is the Black one – it would be the most versatile. I like the brown one! I would love the black one! Black, can never go wrong with that! I love the Black! ? They all look great but I’d choose the black option! White is gorgeous – such a dramatic statement even with jeans and a t-shirt! I’d like the brown – I don’t have any bags this colour and I think it would be great to try something new. I really love the brown one! Mustard – my favourite colour! All of them! A fab design. If I had to choose I would go for the black. I think that black one is lovely. The black with gold – it goes with everything! The mustard shade is my favourite. I like the white one. I would love the white please. I love the black one – will go with anything! I would choose the mustard one, I like a pop of colour! They are all great but I love the mustard one! They are all gorgeous but if I have to choose it would be the black one. I like the black one, thanks for the giveaway. I love the black one. Great choice of colours but I prefer the mustard one. I’d love the black please would go with any outfit. It’s classic black for me. the black is a classic, so versatile! MUSTARD FOR ME – LOVE SOMETHING A BIT DIFFERENT! The black clutch looks perfect and it would go with practically everything! Oooo, that’s a toughie! All colours are absolutely gorgeous but, if I must, I’d love the bag in brown, please. I would absolutely love this stunning bag in black! I always tend to wear something black, whether it be a top with jeans in the day, or a little black dress at night, so this would be perfect! brown or black, classic and doesn’t show the dirt!!! The white one please as I am sadly lacking that colour in my handbag collection. The white would look beautiful on my travels to Italy!! I love the black one, so elegant! The black one is really nice. I like the black version – stylish and classic! The mustard one is lush!!! White or mustard. I love both. The white and black one is very smart and stylish. I like two of the colours but I’d choose the black one. I’d like the tan one please! I love the brown colour one. How exciting you one of the very first to get your hands on one of these bags. I don’t mind the mustard, (only because I ALWAYS choose black) but hey, black is classic which you can’t go wrong with.